Jamey Stegmaier has a strong passion for creating games that bring people together in the spirit of fun, competition, and strategic thinking. With a lifelong enthusiasm for playing and designing board games, he runs the business side of StonemaierGames along with Alan Stone. Together through their start-up company, the two produced Jamey’s first published title, Viticulture. Stonemaier Games is seeking to publish Jamey’s latest design, Euphoria: Build a Better Dystopia. Their Kickstarter campaign funded in, like, one hour (it was beast! ), but it will still run through June 12. If you’d like to participate, there are still plenty of stretch goals to aim for and lots of neat-looking stuff that you can get in on! We asked Jamey a few questions about this title, and he was gracious enough to talk with us. Jamey, every successful Totalitarian State needs a grandiose propagandist slogan. So describe Euphoria: Build a Better Dystopia in one sentence. 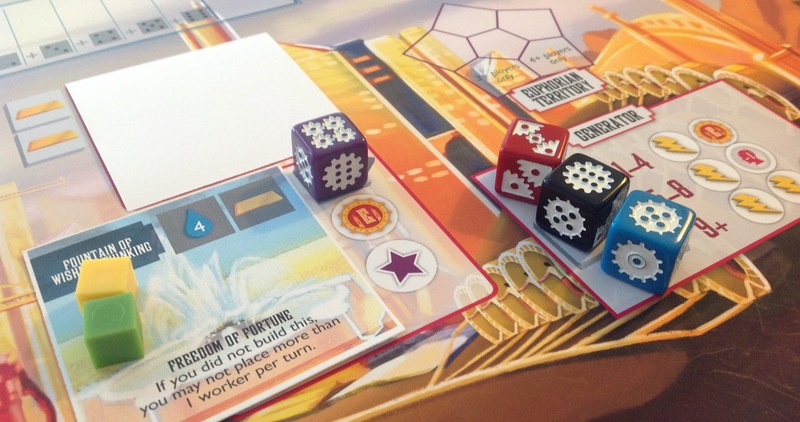 A dystopian cityscape awaits your leadership as you make strategic choices to construct markets, enhance allegiances, and expand control in this thematic, dice worker-placement game. Imagine that the only world you’ve ever known is one where skyscrapers are painted in a thick layer of gold, illuminated by the electricity you help produce by running in the endless generator fields day after day. You go home to a full meal every day and enjoy one of the few books you’re allowed to read by candlelight. You consider it a decent life because it’s the only one you’ve ever known. And then one day on the walk home from the generator, you trip over something in the dirt. You pry it out of the earth and tuck it under your state-issued shirt, waiting to open it in private. At first you don’t know what it is, but then you realize: It’s a board game. You’ve never seen one before – objects of leisure aren’t allowed in the city. Time is scarce, as is paper. The only books you’ve ever read are digital. The game ignites your curiosity. What other relics have been forgotten to the past, and why? As you dig deeper, the more things don’t add up. Why do you run on a glorified treadmill for 8 hours a day while the elite sip daiquiris in their penthouses? Why are all citizens required to receive shock treatments once a month? And what’s in the ubiquitous cubes of food you’re served every day? The more you learn, the more you decide that things need to change. And you’re the one to do it. It takes time to position yourself for the takeover. You work your way up the ranks, acquire a few workers under your supervision. You recruit a specialist who pledges allegiance to you. Now it’s time to take the next step. What are you willing to sacrifice to build a better dystopia? What particularly about the post-apocalyptic, future sci-fi, neo-steampunk theme appealed to you and the design team? I like that you perceive the world of Euphoria as a sum of those parts, because you’re right – it’s not just steampunk, nor is it just post-apocalyptic or future sci-fi. There are three different factions with very unique styles and specializations. The appeal to me in creating this world is that I wanted a game that would tell a story in the vein of the dystopian literature I love. I am consistently drawn to dystopian fiction—most recently in the form of The Hunger Games, Pure, Wool, and Oryx and Crake, but dating back much further to Fahrenheit 451 and Brave New World. Not to mention a host of movies who have really interesting dystopian themes. I wanted to capture the mystery of those novels, the way society becomes just twisted enough that it’s different but we can still see glimmers of our modern-day world in it. I wanted to capture the sense that a single person can make a significant impact on the future of the world, but that it’s tough to do so without making some challenging moral decisions along the way. Bringing all of those elements to life in a board game is what appealed to me. Do you read dystopian literature? If so, what are some of your favorite books? *gulp* So, the cross-examining begins, eh? No doubt, the beginnings of a nefarious attempt to lure me in for assimilation! Is that shock treatment you mentioned earlier going to be next?! Well, actually, I do not read much dystopian, per se, but I do read a lot of steampunk. While my favorites all deal with an historically alternate Victorian era, others utilize the genre’s tropes in dystopian settings. My favorite would be Philip Reeve’s Hungry City Chronicles about stinking great big cities like London on ginormous tractor treads rolling around Earth’s post-apocalyptic wastelands looking for unfortunate, smaller towns to – literally – gobble up under the guise of ‘Municipal Darwinism.’ Of course, to start out, the protagonist (a low level, professional apprentice lackey) knows no other way of life and thinks that metro-munching is perfectly normally – but comes to see differently and fights against the system to change things, much like it sounds like in your world of Euphoria. Now, put that needle away! Why did you choose the “dice-as-workers” mechanic? It sounds like Euphoria was more of a theme-driven project? How did the mechanics begin to mesh with it? Good question. Euphoria was extremely theme-driven. In fact, I went through many, many mechanics before I found the right fit for the theme – the theme always came first. The dice were a core part of the game from the very beginning because I knew that I wanted the knowledge of the workers to have an impact on the game. You can’t track individual worker knowledge using standard meeples, but I realized that dice were perfect. The number on each die would reflect that worker’s knowledge. Unlike other games where knowledge or intelligence is a good thing, I knew that knowledge would be something that you’d try to keep low in this dystopian world. After all, you don’t want your workers realizing that they’re in a dystopia – if they do, they might run away. Of course, the mechanic changed over time. Early on, dice were never rolled. When a worker gained knowledge, you increased the number on that die by one. I quickly realized that dice are much more fun when they’re being rolled, so the mechanics of randomness and luck changed quite a bit over time. But the numbers on the dice reflecting worker knowledge has stayed the same since Day One. How do you feel about dice in games? There’s always the roll-and-move stigma and the high-luck stigma, but I’m hoping backers will see right away that dice aren’t used that way in Euphoria. Oh, I’m just fine with dice. They add spice and excitement; plus luck is a nice equalizer when gaming with kids who may not be as experienced or think as strategically as adults. In fact, while we’re on the subject, you’re right. Gamers are known to engage in debates ad nauseum about the pros and cons of randomness in hobby gaming and to the extent its inclusion is “acceptable.” Some can’t stomach any form of luck, others relish chaos, and most stand somewhere in between. Seeing as there is a dice mechanic in Euphoria, what are your thoughts on the subject, in general? Ah yes, the eternal question of randomness, variability, and luck. If you asked me this question about a year ago, I would have said that I want a game with absolutely no luck or randomness. But I’ve changed a lot since then. Back then, I think I was overly influenced by Settlers of Catan. I still enjoy Catan, but in Catan you’re at the whim of the dice. No matter how well you diversify, if your numbers aren’t rolled, there’s absolutely nothing you can do. However, there’s a different kind of randomness that other games utilize. It’s the type of randomness that keeps you on your toes and makes you maximize opportunities at every turn. It’s the random hand of cards you’re passed in 7 Wonders. It’s the random starting tiles you receive in Tzolk’in. It’s the random dice roll in Alien Frontiers. To me, it’s that type of randomness that keeps games fresh and interesting. How fun would 7 Wonders be if you could look at every card in the deck and choose the one you want? How interesting would Tzolk’in be if you had the same starting resources every time (okay, still pretty interesting). And how interesting would Alien Frontiers be if you got to choose the numbers on your dice instead of rolling them? So the challenge with Euphoria is to make dice matter, but not to put players at their whim. It took some work to get where we are, but the result is really compelling to someone like me who wants to be in control of my strategic choices. How has your previous work on Viticulture helped or hindered Euphoria? This being your sophomore design, have you found things going smoother? Or have you run into other unforeseen difficulties? 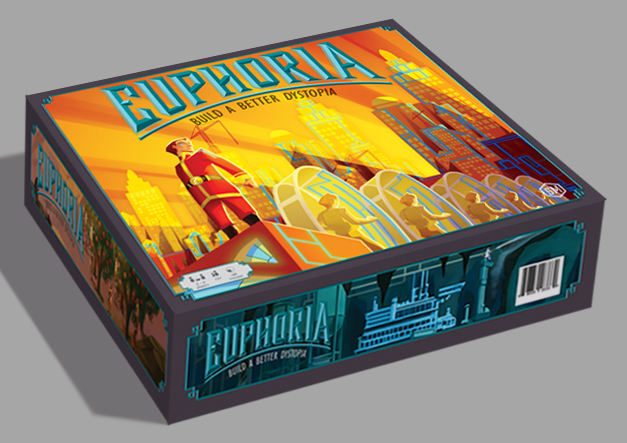 Oh, I can’t even tell you how much my work on Viticulture helped the design process for Euphoria. You know how when you played chess for the first time, you could only think one turn ahead? But the next time you play, you’re able to think two turns ahead, then three, then even more. I experienced that with Euphoria. Although I never knew exactly what would work (that’s what playtesting is for), there were many times that I knew what wouldn’t work after playing it out in brainstorming sessions. I did run into one unforeseen difficulty with Euphoria in that my knowledge of existing board games and mechanics is exponentially larger than it was when I was designing Viticulture. That’s a blessing and a curse because I was strongly motivated to make something completely new, and yet I’m more aware than ever of how hard it is to be innovative among a pool of literally thousands of tabletop games. It made for a great challenge, and I’m really pleased with the final product despite those odds. What gamer type(s) do you think Euphoria will appeal to and have you made any deliberate efforts to serve a particular segment of the hobby? Interesting question. I think Euphoria will appeal to gamers who like Alien Frontiers, Tzolk’in, and The Manhattan Project. Those are all Euro games with light sci-fi themes, just like Euphoria. Euphoria is a Euro game, but I consider it strongly thematic in a number of different areas: You’re digging tunnels to infiltrate other areas of the world, you have secret allegiances and elements of deduction, there are things you can do that change the rules during the game for other players, and each player has recruit cards that strongly impact their strategy (not unlike Cosmic Encounter). Although the end-game is to score a certain number of points, it’s not a matter of scoring a dozen different categories and moving a token around a point track (I love many games that do that, but let’s be honest: There’s nothing in real life that equates to adding up points at the end of the day). Rather, it’s a matter of placing 10 ownership tokens on the board as you grab swaths of land. The first player to place his or her 10 tokens wins. We didn’t intentionally target a specific segment of the hobby – although I’m hoping that Euphoria appeals to gamers who turned a blind eye on Viticulture because it involved making wine instead of exploring space or fighting dragons. Really, as with Viticulture, I designed a game that I want to play. I always try to keep the audience in mind – after all, we had 60+ blind playtesters across the world – but I think you have to design games for yourself first and foremost. If you’re trying to fill a gap in the market with a game you could care less about, why? Where’s the fun in that? Which Euro game that you’ve played has the best integration of theme and mechanics? Ah, a couple come to mind quickly. More popularly known, I’d say Cyclades– essentially it is a building game with a heavy bidding element and the “victory points” are disguised as constructing parts of two metropolises needed for the win. Of course you can only do what the gods allow you to do, and there’s some delicious interaction and wondrous creatures and all three of those parts make sense. Very smooth and intuitive. The rules for Euphoria state that there are no specific phases. Resolution is a little different than most other worker placement games where there are clearly delineated “placement” and “collection” phases. How did that mechanic develop and/or was it inspired by something particular? What kind of unique game play did it bring to the table during playtesting that other titles might not offer? So the true innovation here is the flow of the game. There are no phases, action checklists, or rounds in Euphoria. On your turn you either place a worker or you retrieve all of your workers. Simple as that. The game never stops – you don’t need to be that guy at the table who reminds everyone what season or round it is. Nor does the game dictate when you have to stop playing. You play until someone wins. The beauty is that a very meaty game that could last 2 hours only takes 15 minutes per player once you know how to play, and there’s hardly any down time at all. You roll your dice every time you take workers off the board, so often by the time you’ve rolled and glanced over the board, it’s your turn again. The inspiration for this was partially Viticulture (which I love, obviously, but I’m always that guy who reminds everyone that we’re moving on to a new season or that it’s the end of the year and we have to age our wine and grapes) and partially Alien Frontiers, Tzolk’in, and The Manhattan Project, all of which have elegant placement/retrieve mechanics. However, the difference between all of them and Euphoria is that for those games, you place ALL of your workers during your turn. That’s too much down-time for me, especially in a 5- or 6-player game. I like bite-sized turns where you have to make one decision. Plus, it leads to new dynamics in the game. Do you try to bump your own worker? Do you pile onto a commodity area that already has a lot of workers to get a bonus? Do you join other workers on a construction site to build a market? All of these choices open up thanks to workers being placed one at a time. So, you mentioned particularly enjoying Tzolk’in. What other types of games do you typically play, when not designing your own projects? I host a weekly game night every Wednesday, and the games vary depending on the number of players. My gamer endorphins usually trigger when playing analytical worker-placement games. You mentioned Tzolk’in – I’ll play that any time. Same with Agricola. 7 Wonders makes it to the table a fair amount because it works well for larger groups. I was recently introduced to Pandemic, and I enjoyed it much more than I thought – I liked the brain-burn of it and the interaction it necessitates. Overall, though, according to my ranks on BGG (username: jameystegmaier), my top games are Tzolk’in, Agricola, Pandemic, Stone Age, and, of course, Viticulture. What is your top 5? Ooh, I always I have difficulty with these kinds of lists! I’d say, in no particular order: Citadels, Cyclades, Stone Age, Small World, and Jambo. How’s that for strange bedfellows? Anything else in the works that we can look forward to that you’re willing and able to share? Sure, I’m happy to share what might be next for Stonemaier Games. Alan is working on a prohibition-era game, and I’m working on a game for 4-8 players that I’m excited to get to the table. Also, if Viticulture is received well by the public, we’d like to release a cohesive expansion pack that will expand the world beyond the vineyard. I’ve been brainstorming ideas for those expansions for months, but due to Euphoria and the uncertainty of how Viticulture will sell, I’ve been holding off on really moving forward with them. Good stuff, and all! But enough silliness. I’ve yet to ask the most important question: You’ve just discovered that you’re in charge of board game entertainment at a dinner for the President and First Lady of theUnited States. What title do you choose and why?! Pandemic. Definitely Pandemic. I would love to see how the President and the First Lady respond to threats that arise throughout the game, to see if they value some countries more than others. I’d like to see how they interact with each other as they try to solve the puzzle. Plus, cooperative games are really easy to teach, so that would make for a less stressful evening. Because let’s face it: No matter your political affiliation, you have to be on your best behavior when you’re playing board games with the President of the United States. Thanks, Jamey, for taking the time to talk with us here at iSlaytheDragon. From just the title alone, Euphoria: Build a Better Dystopia sounds like it’ll really evoke its theme with poetically euphemistic double-speak. I saw the “Arena of Peaceful Conflict” on the web site – very nice! This definitely looks intriguing for fans of Euros, worker-placement, dice mechanics, and George Orwell! Wonderful interview! I cannot wait to try euphoria!